Larger screen than most monitors. Connects up to 8 cameras for multi-room viewing. (One camera included). Rechargeable battery continues to operate on AC power when battery is low. Would benefit from a higher volume setting. The advertised range of 1000' is for unobstructed outdoor spaces. Effective indoor range is less than expected. (The manual describes the maximum indoor distance as 160'). You may need to turn the unit off to get a full battery charge. Video baby monitors such as the VTech VM343 have kept pace with advancing technology and now offer high quality sound and video missing from older generation devices. Parents have many options to keep track of their baby’s activity and the VM343 Safe & Sound monitor has just about every feature you would need from your baby’s infancy through early childhood. Early models broadcast non-digital, or analog, radio signals that were troubled by noise from nearby electronic and wireless sources. Sounds from older monitors were sometimes recognizable as ‘cross-talk’ through phones and radios within transmission range. Although some modern digital units can still experience occasional wireless interference, higher quality devices including the VTech VM343 are less effected and their signals are encrypted so any captured sounds are private and unrecognizable. A different category of monitoring system allows remote internet access for viewing childcare activities while on vacation or at the office. The VTech VM343 belongs to the class of digital wireless systems designed for in-home use only. Comparable products, such as the Infant Optics DXR-8 Portable Video Baby Monitor, include many of the same features but at a higher price with smaller 3.5 inch screens and optional features you may or may not need. The DXR-8 offers an interchangeable lens system that, at an extra cost, allows you to replace its existing optics with a wide-angle or zoom lens. You may find that the VM343 field of view and zoom capabilities are perfectly suitable for your chosen camera placement. The DXR-8 model connects up to four cameras compared to VTech’s eight. That might seem like more cameras than you would ever need, however, families with more than one child and multiple play areas will appreciate the higher capability of the VTech system. Parent’s of older children would especially benefit from the choice of placing extra cameras in non-traditional spaces such as laundry rooms or basements to alert them to the presence of their curious and roaming toddlers. The VM343 system grows as your family grows and even after you no longer need to keep such a close eye on your kids as they get older, some families continue to use their VTech systems to monitor bedrooms, halls, and entry ways to keep an eye on movement around doorways or track their pets’ activity. The advertised range of 1000′ is for unobstructed outdoor spaces. Effective indoor range is less than expected. (The manual describes the maximum indoor distance as 160′). 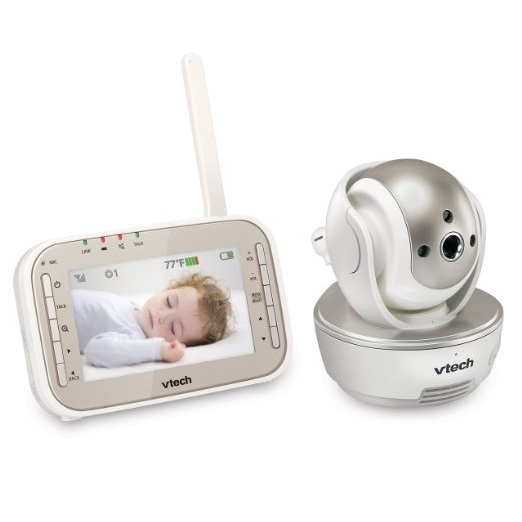 The VTech VM343 Safe & Sound digital video baby monitory is affordably priced with a full package of contemporary features often found in more expensive models. With its high sound sensitivity and talk-back feature, you can quickly comfort and soothe your child as if you were right there in the room with them. When deciding which brand and model of baby monitor is right for you, be sure to download and review each product’s user manual to be sure you have a complete and accurate understanding of what the product actually includes and how easy it is to operate. The VTech VM343 is right there among the best digital video monitors available today.